Cabbage is an overlooked vegetable that has a world of potential beyond the typical sauerkraut and coleslaw that most people tend to associate with it. It marries well with pork cuts of all kinds. Slowly cooked with butter, olive oil or duck fat, it becomes silky, luscious and meltingly tender. Combined with other vegetables, such as leeks or kale and with heaps of mashed potatoes, it becomes a classic Irish specialty known as colcannon. It need not remind one of under-seasoned cafeteria food at a British boarding school in a previous century. If you begin to smell the familiar odor that’s commonly associated with cooked cabbage, you may have cooked it for too long. Keep the cooking brief to prevent loss of nutrients and to help preserve its color. Fresh cabbage has a shiny, crisp appearance. When selecting at the market, pick one up to see if it feels compact. Generally, the heavier a cabbage, the more dense it is. A standard rule when shopping for cabbage or any vegetables is to avoid those that are wilted or shriveled. Pancetta is sometimes called “Italian bacon”. However, unlike American bacon which is often smoked, pancetta is typically unsmoked pork belly that is cured with a combination of herbs, seasonings and spices that can include rosemary, brown sugar, juniper berries, bay leaves and/or black pepper, then air-dried for a few months. Pancetta adds a distinctive pork flavor to pasta and other dishes, without infusing them with bacon’s smokiness. In the United States, it’s a common substitute for guanciale, which is the cured pork cheek that is the traditional base for many classic pasta dishes, such as fettucine carbonara or bucatini all’amatriciana. I love thick cut-pancetta, chopped into bits and slowly fried to a crisp, then cooked with sliced cauliflower, the first peas of spring or diced zucchini or summer squash. Occasionally, I use it as a foundation of minestrone. This recipe is as simple as it gets. You can even omit the wine and butter, which I added for an extra layer of flavor and richness, and it would still be delicious. Place the pancetta in a large, deep skillet, and cook over medium heat. Once the pancetta begins to crisp, add the onion to the pan. Cook, stirring frequently, until the onion browns and becomes translucent, about 10 minutes. Add the cabbage to the pan, along with a pinch of salt and a few grinds of black pepper. Fold the cabbage into the onion mixture, taking care not to let anything burn. Give an occasional stir. At this point, add the wine if you wish. The addition of liquid will cause the cabbage to cook fairly quickly; if you omit the wine, the cabbage is done once it becomes tender-crisp. If you decide to add the wine, reduce heat to medium-low and cook, stirring occasionally, until the cabbage reaches desired tenderness, then remove from heat. There’s a fine line between “cooked” and “overcooked”. Stir in butter, if using. Taste for salt and pepper, sprinkle with chopped parsley, then serve at once. This is my first entry for Simple and in Season for January 2012, a monthly food-blogging event hosted and organized by Ren of Fabulicious Food! 19 Jan	This entry was published on January 19, 2012 at 1:27 am. 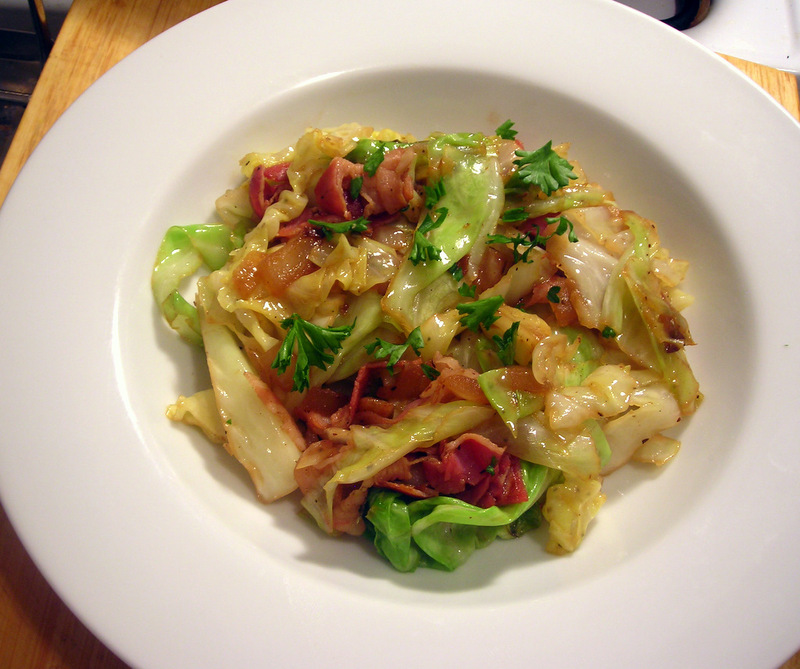 It’s filed under food, food photography, winter and tagged appetizer, cabbage, dinner, food photography, modern American cuisine, pancetta. Bookmark the permalink. Follow any comments here with the RSS feed for this post.